Many warehouses utilize a forklift for quickly moving stock. Indoor forklifts typically have electric-powered motors. A forklift is a piece of machinery which is used to lift and move large loads. There are numerous useful applications for a forklift, and many warehouses, construction sites, and manufacturing facilities have forklifts on hand. There are a number of different types of forklifts, intended to meet various weight limits and consumer needs. Several manufacturers dominate the forklift industry, including Crown and Toyota. Suppliers of heavy machinery usually stock a range of forklifts for consumers in need, both new and used. The history of the forklift dates back to the 1920s, when several manufacturers began to explore new designs for lifting trucks. The simple design quickly caught on, and with a few refinements, the forklift became a crucial piece of equipment in a wide range of work spaces. Operators are specially trained on forklifts so that they understand the limitations of the device, and the rules of safe and efficient operation. Numerous safety improvements have also been made since the 1920s, including the institution of protected cabs for operators of large forklifts. The crucial part of a forklift is the pronged attachment which juts out from the device. The prongs are inserted under the load to be lifted and raised above the ground by a mast, which can also be tilted to relocate the center of gravity. Once lifted, the load can be moved to another location by the operator. In most cases, the prongs are located in the front of the forklift. In the case of a sideloader, the prongs protrude from one side. The smallest type of forklift is actually a hand truck, operated manually with the assistance of hydraulics. A hand truck is designed for moving small to medium loads around a limited space. The operator pumps the truck to raise hydraulic pressure to manipulate the forks, and wheels the truck by hand. The largest type of forklift is a full motorized truck, with a protected cab for the operator and a very large load limit. 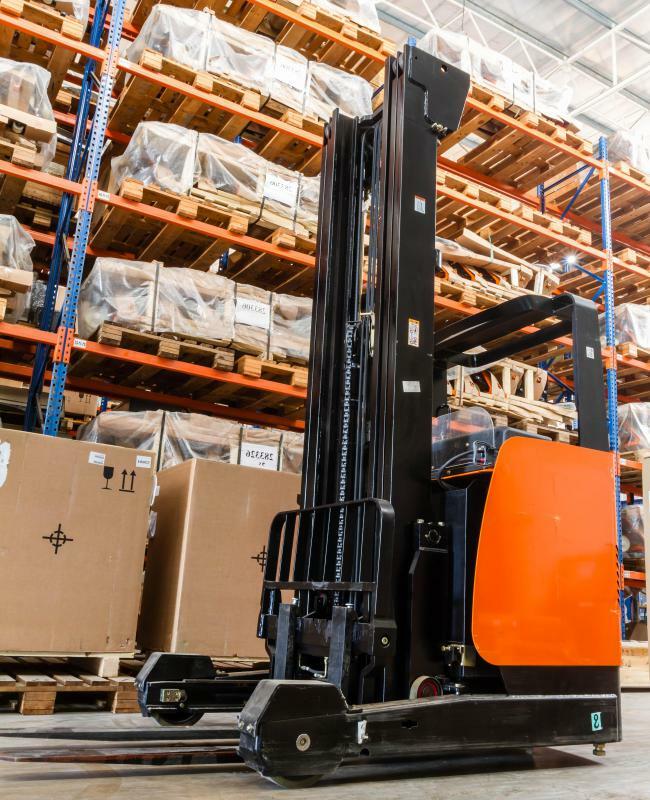 Specialized forklift designs include lift trucks designed for very narrow aisles, such as those found in warehouses, and stackers, forklifts specifically designed for stacking goods and pallets. In warehouse stores, slim and lightweight forklifts and lifting trucks may be used by employees to reach products while the store is open. After hours, when customer safety is no longer an issue, larger forklifts may be employed for big projects and stocking. What Is a Forklift Mast? What Is a Warehouse Forklift? How Do I Choose the Best Cheap Forklift? What Is a Piggyback Forklift? What Is a Propane Forklift? Can we move a truck cabin by using a forklift? @ajvician - There are plenty schools for forklift training; I would advise looking for one that has OSHA Compliance Forklift Certification. If you are an experience forklift operator some schools offer online certification. If you are looking for free forklift training, you should look for a job that will give on-the-job training, which some do. A quick Internet search on forklift training should yield some good information. I really like shopping warehouse stores, but it seems like they are always taping off the aisle that I want to shop in so that the forklift crew can work there. I guess warehouse shopping has advantages and disadvantages. My brother was looking at applying for a job, but he had to have forklift experience. Are there forklift training schools, or even better can you get free forklift training?